Two new restaurants planned for opposite ends of Uptown — the Mellow Mushroom pizzeria on Oak Street, and Mais Arepas Colombian diner on Carondelet in Central City — both passed the City Council with flying colors Thursday morning, as council members lined up to express their enthusiasm for both projects. Mellow Mushroom developer James Son told the council that his restaurant will fill a void for pizza on Oak Street, and will do so with healthier ingredients and gluten-free options that area relatively new to the area. Though the restaurant is a chain, he said, the effect of that will largely be limited to his operational plans — ingredients such as produce will be locally sourced, and even his countertops and signage are being designed by craftsmen on Oak Street. “Whatever is good for Oak street and the neighborhood of Carrollton is also good for us and our property values,” Son said. City Councilwoman Susan Guidry praised Son’s presentation and his many hours of conversations with the Carrollton-Riverbend Neighborhood Association, leading to a good-neighbor agreement with them. 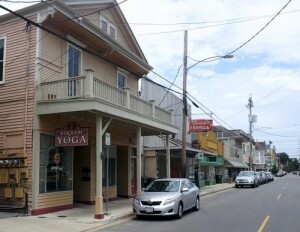 She also noted that the renovation of the former yoga studio is a $2.5 million investment. Councilwoman Stacy Head chimed in with her own praise for the project, but urged Son to continue branching out to other neighborhoods, such as New Orleans East, O.C. Haley Boulevard, or the Ninth Ward. “As you succeed on Oak Street, please bring some of your success to these other areas of the city where we need high-quality family restaurants,” Head said. The next applicant on the agenda, David Mantilla of the Colombian restaurant Mais Arepas, could be said to be doing just that as he renovates a corner business at 1200 Carondelet. To applause from the audience in the city council chambers, Head praised Mantilla for helping “lead the way” in the redevelopment of Central City. Councilwoman Jackie Clarkson joined in the praise, calling Mantilla part of the new breed of entrepreneurs that is representing New Orleans to the rest of the country. Interim District B Councilwoman Diana Bajoie also praised the project — noting the “struggle” of operating a business there in years past — but had one final question for Mantilla before voting to approve his project. Technically, each project falls within a neighborhood — Carrollton and Central City — with a moratorium on liquor licenses, so they each needed an exception from the council in order to apply for an alcohol license. Both requests were approved by 6-0 votes, with Councilwoman Cynthia Hedge-Morrell absent to attend the Democratic National Convention. How will the parking at night in the 1200 block of Carondelet be made safe? Mellow Mushroom is a misnomer. It will substantially increase traffic, noise, and unfortunately the pizza is sub-par. I am excited that they intend to spend 2.5 million to renovate it- expect it to go out if business in 2.5 years.